Eons and eons have gone by since the recording of Epicus Doomicus Metallicus, Candlemass’ seminal foray into heavy music, one that put the country of Sweden on the map and the world on notice. Ten albums have been released since Johan Langqvist helmed the band, with many legends of the genre having filled the role over the years like Messiah Marcolin, Mats Leven and Robert Lowe. Newly minted as an official member for the first time, he joins a band that’s well established internationally and in one of the most important vocal roles in all of heavy metal. So how does he sound 33 years later? To get the ball rolling correctly, Langqvist is thrust upon the listener with “Splendor Demon Majesty,” a reminder that epic doom metal wouldn’t exist today without his individual contributions. The doom riffs feel right at home and more full realized since the last time guitarist Mappe Bjorkman worked with Langqvist. 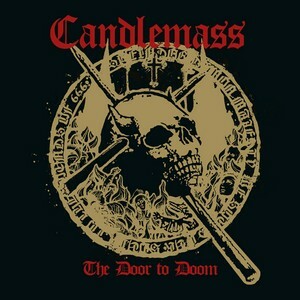 Candlemass feel revitalized on The Door To Doom, which is easily their best work since 2007’s King of the Grey Islands. Careers don’t typically get another chapter, especially after a 33 year hiatus. Langqvist’s return shows the band adding an additional chapter with a vocalist who for the band has always remained more a memory than an actuality, his vocal performances legend. Now they are on display for the world to partake, returning to the man and the logo that made the band a force to be reckoned with. If there was ever a time to be a doom metal fan, let alone a Candlemass fan, 2019 should be a magical year that fans of the low and slow will remember for a long time.